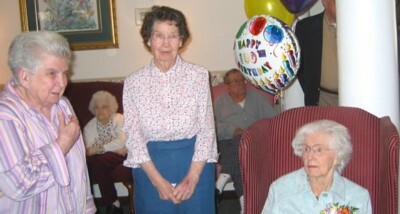 On March 4, 2006, many of us attended a very special birthday celebration at Mulberry Grove Assisted Living in Statham. 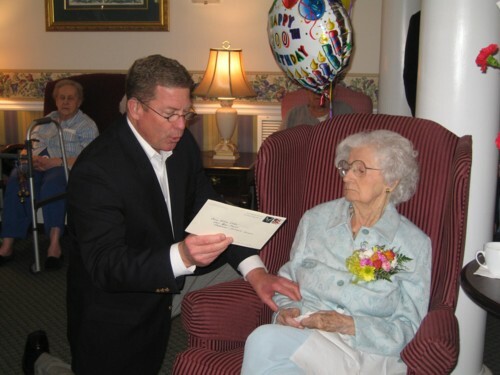 Watkinsville Resident and Oldest Georgia 4 – Her, Willie Oaks turned 100 years of age. It was a beautiful day and she enjoyed the activity. Everyone attending had a great time and many pictures were taken. State Representative Bob Smith, of Watkinsville, read greetings from the President, Governor, Senator Kemp and Representative Smith. He also read a Resolution of the Georgia House. It was a great day and the residents and staff of Mulberry Grove attended, participated and enjoyed it. There are many nice people at the facility. Then on Saturday, March 11, 2006, came the news that Mrs. Oaks passed away in her bed late on Friday night, March 10. It was a shock and sad occasion for many folks. The family suffered the loss of David’s wife, Bunky Oaks, in January. It was a lot to happen to this special family in a short while. We thank the Oaks family for the opportunity to share the occasion of the 100th Birthday Celebration. That is a milestone not reached by many of us. It was a great day that all of us will remember for a long time- about a very special lady. 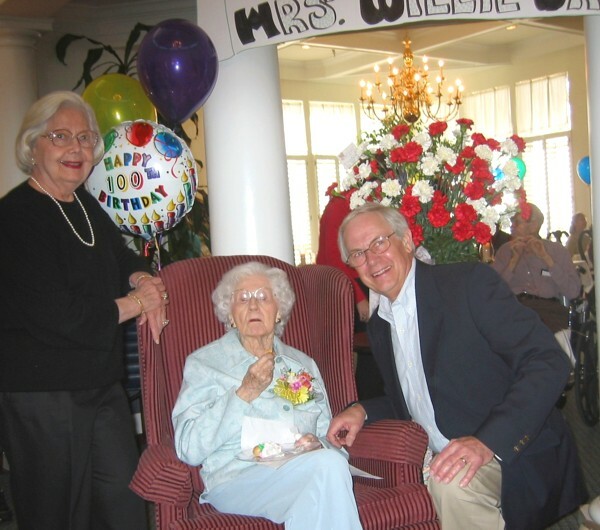 Saturday's celebration for Mrs. Willie Oaks 100th year birthday last week brought friends, family and commu­nity members including her Oconee County state repre­sentative . to Mulberry Grove Assisted Living in Statham. Rep. Bob Smith said he was the bearer of an impor­tant message from the President of the United States. •• The mail came just before I arrived and in it came a card of congratulations for Mrs. Oaks," said Smith. As he read the card, Mrs. Willie sat in her chair of honor and when she real­ized the card was from the President she grinned. Smith also brought greetings and special wishes from Gov. Sonny Perdue and Sen. Brian Kemp who said few people turn 100 years young. "I am proud to share in his momentous occasion to celebrate your full and vibrant life. You are a bless­ing to your family and friends," said Kemp. Along with a letter, Smith brought a Georgia House of Representative Resolution which will always be in the Georgia Archives of state records. "Born on March 2, 1906 in Cleveland County, Ala., you are celebrating an important milestone, your 100th birthday," said Smith. "You have seen the advent of new technology and in 1909 you took your first automobile ride in your uncle's Buick. In 1915 you talked on your first phone and in 1916 you saw an airplane land in a nearby field. You were high school valedictorian and a fourth grade teacher until you mar­ried your high school sweetheart in 1929." 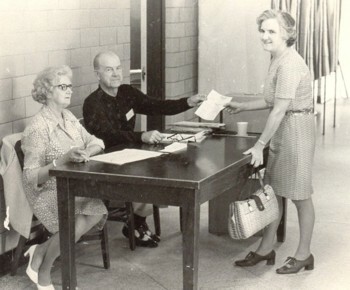 Mrs. Willie, as she is known by everyone at· Mulberry, was a member of the First· United Methodist Church in Oconee County where her husband was an Oconee County Commissioner and an election poll worker. She was also highly involved in the Watkinsville Garden Club- and the cookbook committee. Smith said, he was most impressed that she is the oldest living member of the Georgia 4- H, having joined when she was 12 years old. Watkinsville - Willie Sherrill Oaks, 100, wife of the late Grady A. Oaks, died Friday, March 10, 2006 at Mulberry Grove Assisted Living, Statham, GA.
Born in Cleburne County, AL, she was the daughter of the late Cicero Bright and Lovie Cooke Sherrill. She was a founding member of Watkinsville First United Methodist Church where she was very active with Sunday School and various church boards. Willie was one of the founders of the Oconee County Library, member of the Garden Club, and was the oldest living member of the Georgia 4-H. Survivors include her son; David (his late wife Bunky Bowden) Oaks of Kingsport, TN, O’Joy Oaks Mays of Watkinsville, grandchildren; Leslie (Roy) Sisiam, Trey Phillips, David ‘Bo’ Oaks, and great grandchildren; Joseph Sisiam, David Sisiam, and Kendall Phillips. Funeral services will be private. The family has requested in lieu of flowers memorials be made to Watkinsville First United Methodist Church or to the Oconee County Library. Lord & Stephens, WEST is in charge of arrangements. Published in the Athens Banner-Herald on 3/13/2006.